Bike lights can be frustrating and slow to attach & remove, especially in bad weather with gloves on! By adding magnets to your lights, and your bike, you’ll be able to snap your lights on and off with your gloves on, and in a matter of one very satisfying move. Once you make your lights magnetic, you might wonder why all lights aren’t like this. - x4 strong neodymium magnets (x2 per bike light) - we used the magnets in our sugru + magnets kit - buy one here. - your bicycle, helmet or whatever else you want to attach your lights to! You can try this project using your own neodymium magnets + sugru - but make sure the magnets you choose are strong enough to hold your bike lights while riding. Cut open a minipack and divide it into two equal parts. Top Tip: One minipack of sugru is enough to attach two magnets. Squidge a sausage shape onto the back of the magnet and press it into a pyramid shape. Carefully but firmly press the magnet onto your bike’s handlebars, so that sugru squeezes out around the edge of the magnet. Press the sugru in around the magnet, ensuring there is a good bond. Gently rub the sugru with your finger to smoothen it and leave for 24 hours to fully cure. Top Tip: use a little soapy water on your finger to get a really smooth sugru finish. More tips here. Repeat steps 3-6 to mount the opposing magnet to your bike light. Leave to fully cure for 24 hours before using. Top Tip: Don't forget to make sure you attach the second magnet with the opposing side facing out. If you have ever worked with magnets, you will know that they can be tricky to handle without knowing which sides attract. We designed the sugru + magnets kit to be super easy to use, so we put a small dimple on the north pole of each magnet. All you need to do is make sure one magnet is smooth and the other has a little dimple...simple! You can use the same process to create magnetic rear lights too! Top Tip: Plan ahead to click your lights together for quick and easy storage, just have the dimple facing out on the front light and the smooth side on the back. Nice! ...why not add a magnet to the top of your bike helmet so you can attach your bike light there too! We might have got a little bit carried away with the lights. You made the video private? Huh? un des instructables les plus utiles et immédiatement utilisable jamais lu. Have you tried the attached lights on a bumpy road? I'm not talking about off-road, just pavement with normal cracks. Do they stay in place? Do they jump and fall off? How do the connections hold up against bumps? do the lights jostle significantly? Since the magnets are round, do they have a tendency to rotate (might be a problem for the headlight). This could be a great solution for me as i have multiple bikes and just one headlight/taillight combo. Yup, a friend has a city commuter and a long distance racer and uses magnets for his lights so they transfer easily between them. You are correct, as the magnets are round, there is a little bit of movement but that seems to happen only when you knock the bike about a lot, like hitting a pothole for example. Here's an idea. Before encasing the magnets in sugru, start a small pilot hole on both magnets(be sure to put them off center). On one of the magnets epoxy a tiny ball bearing into the pilot hole. Leave the other hole open. With a little bit of care in the installation process this could eliminate the movement between magnets and make a more solid connection. It's basically a mechanical detent reference. A lot of rifle parts use this same concept! Do you think this could also work with a Phone? I am looking for an easy/ cheap way to attach my phone (Defy+ /118 g 4.16 oz) to my bike for touring/ routing, but not sure if this would stay attatched in rough terrain. Anyone tried this? on second thought, amateurish me should probably not mix big magnet with electronic memory device. 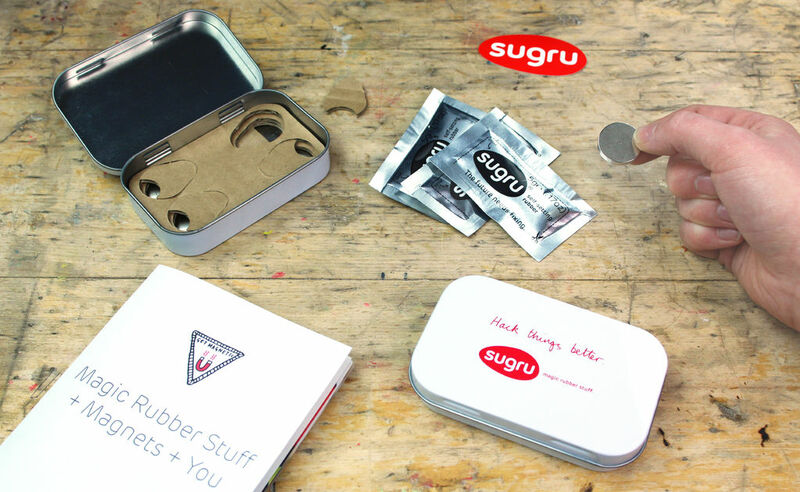 I already have a multi-pack of sugru mini packs. Is there a comparable magnet that I could buy on it's own? I know there's plenty out there, but I'm looking to specifically replicate the strength and size of those tested here. great. We use N42 Neodymium magnets that are 20mm diameter and 3mm thick with a pull force of 4.5Kg. We are pretty proud of the very simple additional feature of a dimple on the north face which makes building this project much easier. Happy hunting. Question, why would you NOT enclose the entire magnet in a thin layer too? At the very least use Plasti-dip on the magnet for weatherproofing, then do the sugru magic. I might try this if it weren't for the insanely high price of sugru. great question. OK, so we have tested coating a magnet in sugru but doe to the high abrasion of the application, it will wear down after some time. Additionally, you will reduce the strength of the magnets. Your plastidip idea is interesting but I don't actually know if sugru will bond to it. A final note, we have tested these magnets for over a year on our bikes in London and they are still going strong with negligible signs of wear. Hope this helps. Nice instructable, I'll have to keep it in mind for future reference. 19 bikes stolen so far and a ton of stuff stolen off them including lights I'm not getting another soon. Not till I move to another state - or perhaps country. I m still a newbie considering this material. I am a fan of epoxies and would use a paste epoxy in this case. I guess I am going to have to experiment with this material. Thanks for the presentation. Maybe this puppy will try another "new" product. sugru has excellent damping properties so that helps absorb a lot of the shock from impact when the magnets strike each other thus helping to prolong their life. sugru sets to a relatively firm rubber. What are the dimensions of the magnets? they look like 3/4"D x 1/8"t ?